Remarkably delicious, this pie is fun and easy to make. For a light-colored piecrust use ivory teff flour; for a chocolate-brown piecrust use brown teff flour. Both are equally scrumptious and both are available at natural foods stores to make great gluten-free pie crust and other baked goods. Contributed by Leslie Cerier, from Gluten-Free Recipes for the Conscious Cook. Photo by Stephanie Ferrate of Gluten-Free West. Delicious served over nondairy ice cream, as shown. Preheat the oven to 375 degrees F. Lightly oil a 9-inch pie pan. To make the crust, combine the teff flour, oil, syrup, vanilla, and salt in a medium-size bowl and stir until well combined. Reserve 1/2 cup of the mixture to use as a crumb topping. Transfer the dough to the prepared pie pan and use your fingers to press it out in an even layer over the bottom and sides of the pan. Poke a few holes in the dough with a fork. Bake for about 10 minutes, or until it loses its shine. Put the peaches in the baked piecrust. 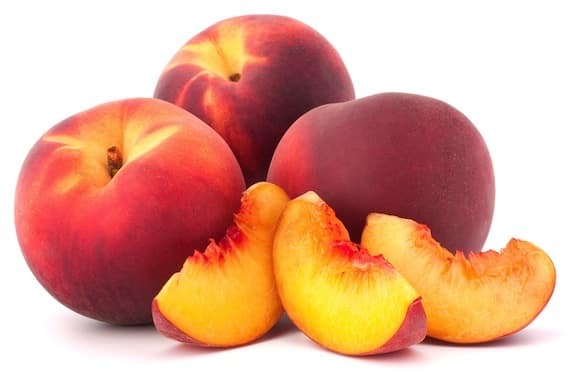 Sprinkle the maple sugar and cinnamon over the peaches. Crumble the reserved dough over the peaches. 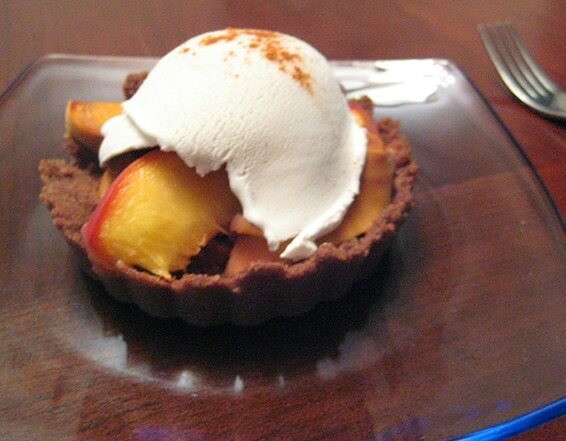 Bake for about 10 minutes, until the crumbs turn a slightly darker brown, and the peaches are tender to your liking. Let the pie cool for at least 30 minutes before serving. Note: Look for teff flour in your natural foods store. Leslie gives a slew of resources for obtaining gluten-free grains online in the book’s appendix. Explore more of VegKitchen’s Gluten-Free Vegan Baking. Sweet tooth still craving? Here are more Vegan Baking and Sweets. Explore more of VegKitchen’s Easy Vegan Cakes and Pies. Here are more Fruity Baked Goods. Reprinted from Gluten-Free Recipes for the Conscious Cook* by permission of New Harbinger Publishing.